^ Lawrence S. Cunningham、John J. Reich. Culture and values: a survey of the humanities. Cengage Learning. 2005年: 第272頁. ISBN 0534582281 （英语）. ^ Thomas F. Glick、Steven John Livesey、Faith Wallis. Medieval science, technology, and medicine: an encyclopedia. Routledge. 2005年: 第298頁. ISBN 0415969301 （英语）. ^ Josef W. Meri、Jere L. Bacharach. Medieval Islamic Civilization: L-Z, index. Taylor & Francis. 2006年: 第567頁. ISBN 0415966922 （英语）. ^ Carl B. Boyer、Uta C. Merzbach. A history of mathematics. Wiley. 1991年: 第228頁. ISBN 0471543977 （英语）. ^ Roland W. Scholz. Decision making under uncertainty: cognitive decision research, social interaction, development and epistemology. Elsevier. 1983年: 第88頁. ISBN 0444867384 （英语）. ^ Joseph Schacht、Clifford Edmund Bosworth. The legacy of Islam. Clarendon Press. 1974年: 第446頁 （英语）. ^ Jeff Suzuki. Mathematics in Historical Context. MAA. 2009年: 第86頁. ISBN 0883855704 （英语）. ^ Abu Rahyan Biruni. Athar al-Baqqiya 'an al-Qurun al-Xaliyyah"(Vestiges of the past: the chronology of ancient nations. Miras-e-Maktub. 2001: 56 （英语）. ^ Michael G. Morony. Iraq After the Muslim Conquest. Gorgias Press LLC. 2005年: 第145頁. ISBN 1593333153 （英语）. ^ George Nicholas Atiyeh、Ibrahim M. Oweiss. Arab civilization: challenges and responses : studies in honor of Constantine K. Zurayk. SUNY Press. 1988年: 第108頁. ISBN 0887066984 （英语）. ^ N.K. Singh、M. Zaki Kirmani. Encyclopaedia of Islamic science and scientists. Global Vision Publishing Ho. 2005年: 第570頁. ISBN 8182200571 （英语）. ^ Corona Brezina. 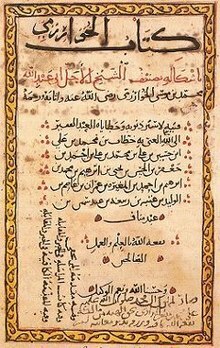 Al-Khwarizmi: the inventor of algebra. The Rosen Publishing Group. 2006年: 第99頁. ISBN 1404205136 （英语）. ^ Stephan Diehl. Software visualization: visualizing the structure, behaviour, and evolution of software. Springer. 2007年: 第87頁. ISBN 3540465049 （英语）. ^ M. J. L. Young、J. D. Latham、R. B. Serjeant. Religion, Learning and Science in the 'Abbasid Period. Cambridge University Press. 2006年: 第305頁. ISBN 0521028876 （英语）. ^ Muḥammad ibn Mūsā al-Khwārizmī. Encyclopædia Britannica. [2009-12-22] （英语）. ^ Khwarizmi, Abu Jafar Muhammad ibn Musa al-. Oxford Islamic Studies Online. [2009-12-22] （英语）. ^ 19.0 19.1 Frederic Rosen. The Compendious Book on Calculation by Completion and Balancing The Compendious Book on Calculation by Completion and Balancing, Al-Khwārizmī. wilbourhall.org. [2009-12-23] （英语）. ^ Louis Charles Karpinski. History of Mathematics in the Recent Edition of the Encyclopædia Britannica. American Association for the Advancement of Science. 1912年 （英语）. ^ Carl B. Boyer、Uta C. Merzbach. A History of Mathematics. Wiley. 1991年: 第228頁. ISBN 0471543977 （英语）. The Arabs in general loved a good clear argument from premise to conclusion, as well as systematic organization — respects in which neither Diophantus nor the Hindus excelled. ^ Carl B. Boyer、Uta C. Merzbach. A History of Mathematics. Wiley. 1991年: 第229頁. ISBN 0471543977 （英语）. It is not certain just what the terms al-jabr and muqabalah mean, but the usual interpretation is similar to that implied in the translation above. The word al-jabr presumably meant something like "restoration" or "completion" and seems to refer to the transposition of subtracted terms to the other side of an equation; the word muqabalah is said to refer to "reduction" or "balancing" — that is, the cancellation of like terms on opposite sides of the equation. ^ John J. O'Connor、Edmund F. Robertson. Muhammad ibn Mūsā al-Khwārizmī. MacTutor History of Mathematics archive. [2009-12-29] （英语）. ^ Rushdī Rāshid、Angela Armstrong. The Development of Arabic Mathematics. Springer. 1994年: 第11–12頁. ISBN 0792325656 （英语）. ^ David C. Lindberg. Science in the Middle Ages. University of Chicago Press. 1980年: 第312頁. ISBN 0226482332 （英语）. ^ J. Lennart Berggren. Episodes in the Mathematics of Medieval Islam. Springer Science+Business Media. 1986年: 第7頁. ISBN 0387963189 （英语）. ^ E. S. Kennedy. 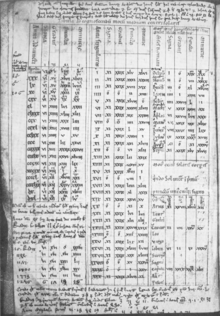 A survey of Islamic astronomical tables. DIANE Publishing. 1956年: 第26–29頁. ISBN 087169462X （英语）. ^ Philip Khuri Hitti. History of the Arabs from the earliest times to the present. Macmillan. 1970年: 第375頁 （英语）. ^ David A. King. 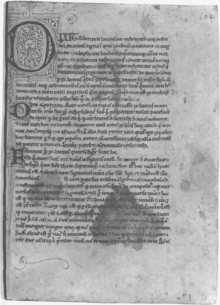 A Vetustissimus Arabic Text on the Quadrans Vetus. Journal for the History of Astronomy. 2002, 33: 237–255 （英语）. ^ 32.0 32.1 32.2 David A. King. A Vetustissimus Arabic Text on the Quadrans Vetus. Journal for the History of Astronomy. 2002, 33: 237–255 （英语）. ^ The history of cartography. GAP computer algebra system. [2010-01-14]. （原始内容存档于2008-05-24） （英语）. ^ 34.0 34.1 Rushdī Rāshid、Régis Morelon. Encyclopedia of the history of Arabic science. Routledge. 1996年: 第185–201頁. ISBN 0415124107 （英语）. ^ Richard Covington. The Third Dimension. Saudi Aramco World. 2007: 17–21 [2010-01-18]. （原始内容存档于2008-05-12） （英语）. ^ N.K. Singh、M. Zaki Kirmani. Encyclopaedia of Islamic science and scientists. Global Vision Publishing Ho. 2005年: 第575頁. ISBN 8182200571 （英语）. ^ Ziauddin Ahmad Suleri. Influence of Islam on world civilization. Royal Book Co. 1994年: 第98頁 （英语）.